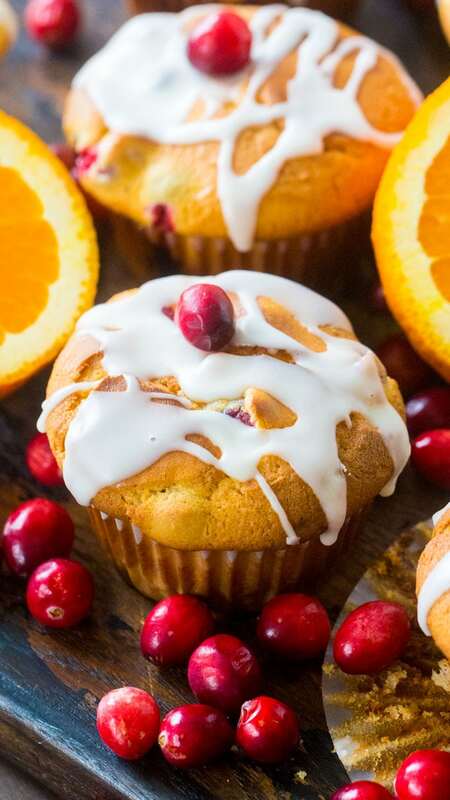 Cranberry Orange Muffins are the perfect fall flavor combo. 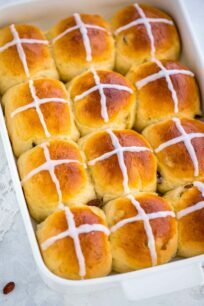 Sweet, fluffy, juicy, with an amazing orange aroma and tart cranberries in every bite. Muffins are a specialty in our kitchen, and we love making them puffy and delicious like Ube Purple Muffins, Chocolate Chip Ricotta Muffins and Blueberry Lemon Muffins. 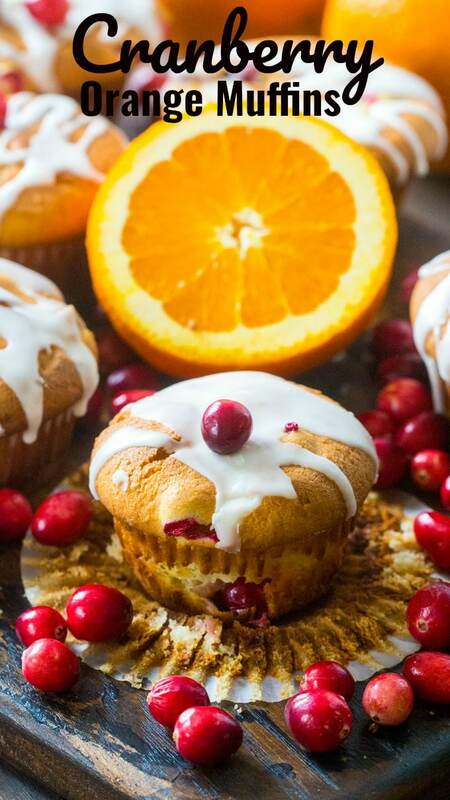 Cranberry Orange Muffins are the perfect way to start a crisp fall morning. During this time of the year, I am ready to add cranberries to anything and everything! 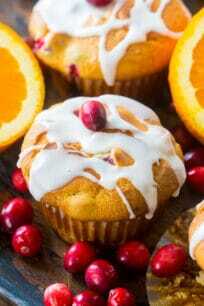 These Cranberry Orange Muffins are so fluffy, sweet, tart, juicy and refreshing! They are pretty to look at, and very tasty that they are hard to resist. Nothing like having a combination of sweet, tart and citrusy all in one bite! Did I mention that they are ready in about 30 minutes? Yes, that too! Looking for more fun muffin recipes? Don’t skip the orange zest, it will add the most amazing, citrusy, refreshing flavor! 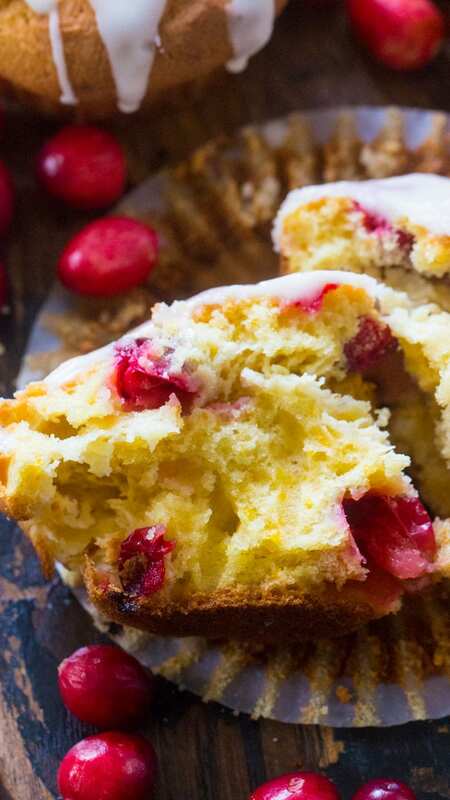 I prefer to use fresh cranberries in this recipe, frozen will work too, just don’t the them. Make sure you don’t over bake them, start checking at the 20 minutes mark. If you don’t have yogurt on hand, you can use full fat sour cream. The Orange Glaze is optional, can be skipped if you want to cut on sugar. The muffins are great served warm with butter! Cupcake Liners – when it comes to cupcake/muffin liners the sky is the limit, I like to keep them in a wide range of colors so I can use it based on the recipe or event. 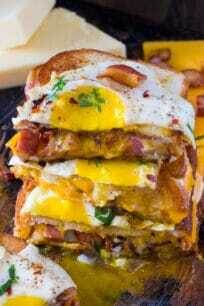 Whole Nutmegs – one of my favorite spices, I LOVE the flavor and I add it to savory and sweet recipes, I also prefer the whole ones as they pack more flavor. Cinnamon – love adding it to bake goods and it works so well with the purple yams. Cinnamon Sticks – I always keep some on hand, in case I want to make fresh cinnamon powder. Preheat oven to 425F degrees. Line a 12-count muffin pan with cupcake liners. Set aside. In a medium bowl, using a mixer fitted with a paddle attachment, beat the butter on high speed until smooth and creamy, about 1 minute. Scrape the sides of the bowl with a spatula. Add the granulated and beat on high until fully combined, about 2 minutes. Scrape the sides and bottom of the bowl as needed. Add the eggs, greek yogurt, and vanilla extract. Whisk for about 2 minutes, starting on medium speed and gradually increasing it to high speed. Scrape down the sides and bottom of the bowl as needed. Beat in the orange zest until combined. Add the flour, baking soda, baking powder, cinnamon, nutmeg and salt to a large bowl. Stir together to combined. Add the flour mixture to the wet ingredients and gently stir in until fully combined. Slowly whisk in the orange juice and milk until combined and little lumps remain. Using a spatula or wooden spoon, fold int the cranberries. You can also use frozen cranberries, just don't thaw them if you decide to use them. Spoon batter into the prepared muffin pan, filling them all the way to the top. Top each muffin tip with a few more cranberries. Bake for 5 minutes at 425F degrees, then lower the temperature to 350F degrees and bake for 18-20 more minutes more or until a toothpick inserted in the center comes out clean. Remove muffins from oven, let them cool in the pan for 5 minutes, then remove them from tins and transfer to a cooling rack. Let the muffins completely cool before topping with the glaze. Add all the ingredients to a medium bowl and stir to fully combine. If the glaze is too thick, add a bit more juice. If the glaze is too thick, add a little more sugar. 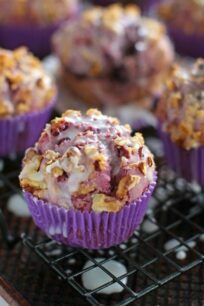 Ube Muffins – Naturally Purple!